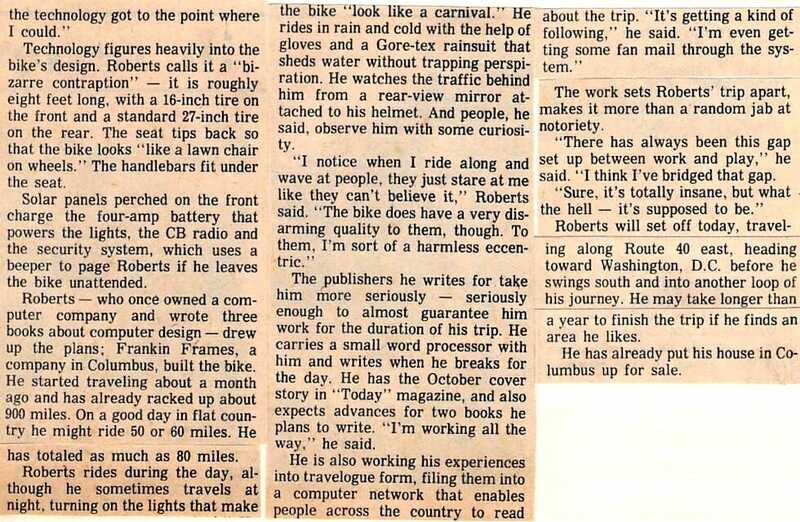 This was the first article written after my departure from Ohio in 1983 (not counting the shakedown cruise), and it brings back fond memories… they caught up with me at the mall in Uniontown, Pennsylvania, where the security guard had just ordered me to get my bike outside. A diminutive, feisty old woman hissed at him: “First Nastassja Kinski’s dog, now this?” (Apparently, they had kicked her out as well.) One thing led to another, and I ended up visiting the fascinating Pressley Ridge Wilderness School… and it’s a chapter in my book. Sometimes Steve Roberts cannot believe the way he used to live. Roberts is still a free-lance writer. But he has left behind his house in Columbus, Ohio, along with its responsibilities. And the only chain that binds is the one that reels in the miles on his bicycle — his companion in a 14,000 mile one-year loop around the United States. 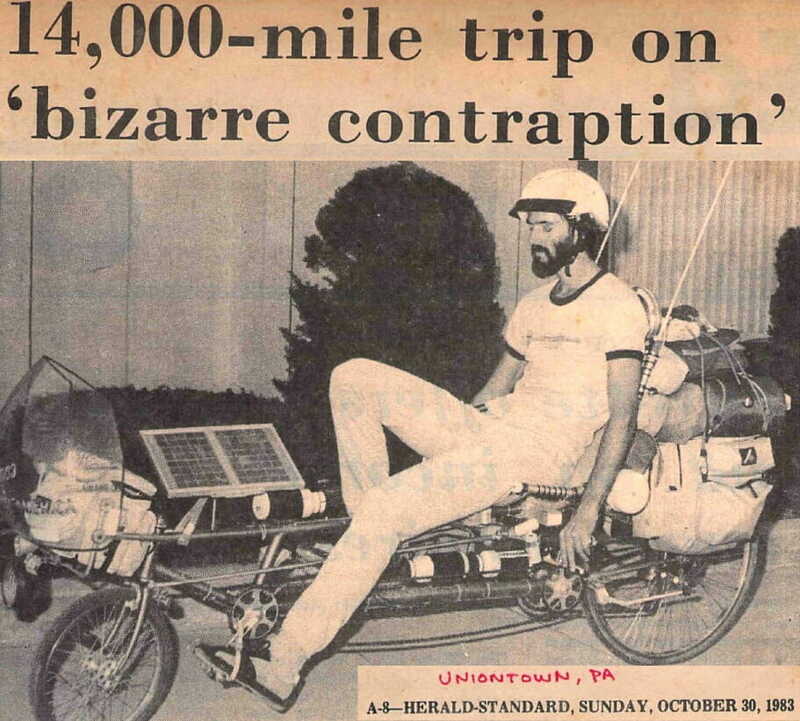 Roberts paused in Uniontown this weekend to finish an article for Online Today, a high-tech magazine, and to talk about his cross-country trek. Technology figures heavily into the bike’s design. Roberts calls it a “bizarre contraption” — it is roughly eight feet long, with a 16-inch tire on the front and a standard 27-inch tire on the rear. The seat tips back so that the bike looks “like a lawn chair on wheels.” The handlebars fit under the seat. Solar panels perched on the front charge the four-amp-hour battery that powers the lights, the CB radio and the security system, which uses a beeper to page Roberts if he leaves the bike unattended. 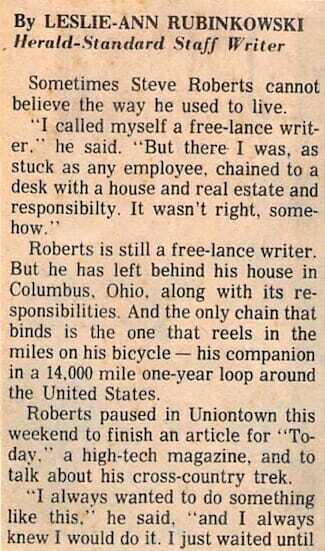 Roberts — who once owned a computer company and wrote three books about computer design — drew up the plans; Franklin Frames, a company in Columbus, built the bike. He started traveling about a month ago and has already racked up about 900 miles. On a good day in flat country he might ride 50 or 60 miles. He has totaled as much as 80 miles. Roberts rides during the day, although he sometimes travels at night, turning on the lights that make the bike “look like a carnival.” He rides in rain and cold with the help of gloves and a Gore-Tex rain suit that sheds water without trapping perspiration. He watches the traffic behind him from a rear-view mirror attached to his helmet. And people, he said, observe him with some curiosity. The publishers he writes for take him more seriously — seriously enough to almost guarantee him work for the duration of his trip. He carries a small word processor with him and writes when he breaks for the day. He has the October cover story in Online Today magazine, and also expects advances for two books he plans to write. “I’m working all the way,” he said. The work sets Roberts’ trip apart, makes it more than a random jab at notoriety. “There has always been this gap set up between work and play,” he said. “I think I’ve bridged that gap. Roberts will set off today, traveling along Route 40 east, heading toward Washington, D.C. before he swings south and into another loop of his journey. He may take longer than a year to finish the trip if he finds an area he likes. He has already put his house in Columbus up for sale.